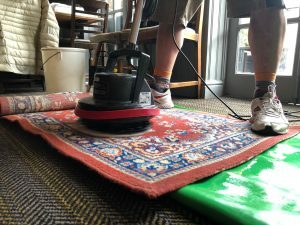 Make your carpets and rugs look like new with the help of a friendly, professional cleaning service. 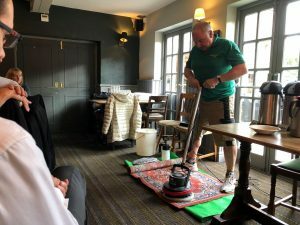 This month, Steve Hayward of EcoKlean put on a fascinating demonstration involving his machines and a natural, plant based cleaning solution which is used to break down dirt in carpet fibres. 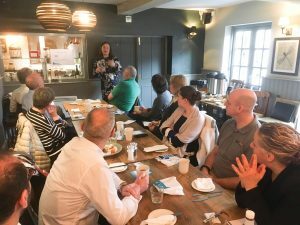 We also welcomed a new business – Leigh Davies and Amanda Green from The Property Presenters – plus plenty of familiar faces who all had the chance to chat and network over breakfast at The Feathers Inn, a charming village pub just outside Ware, Hertfordshire. Photos courtesy of Alison Jenkins Photography. How secure is your business from the threats posed by cyber crime? 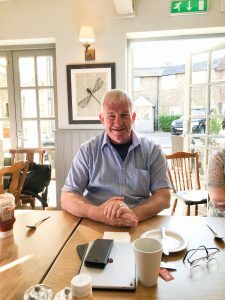 That was the theme for this month’s meeting when Graham Horne of Amwell Information Security spoke about some of the steps that SMEs can take to protect their systems and data. 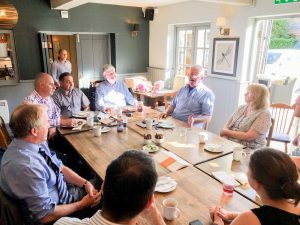 This month we welcomed three new businesses to the group, as well as plenty of familiar faces who all had the chance to chat and network over breakfast at The Feathers Inn, a charming village pub just outside Ware, Hertfordshire. Purchasing a home is one of life’s big decisions, which is why it is essential to hire the services of a legal professional. This month, Amanda Thurston from Curwens LLP spoke about buying and selling property and the vital role conveyancing solicitors play in the process. Amanda covered the legal requirements for buyers and vendors, as well as potential problems which can delay the sale of a house going through. 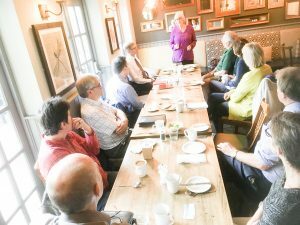 As always, we enjoyed a delicious breakfast at The Feathers Inn, Wadesmill, Hertfordshire, and had a chance to network and chat about business. 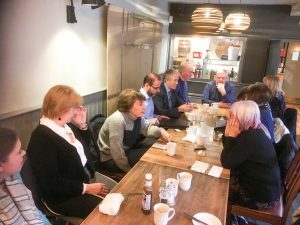 The aim of the first Ware To Do Business networking meeting of 2019 was to learn a bit more about each other. Regulars, new faces and returning visitors all had to share three facts about themselves or their business, but one fact had to be false. The rest of the group then had to guess which statement was a porky-pie. Supersleuth Sarah Pohlinger of Leabourne Financial Advice won the game, correctly guessing 10 out of 13. Acting chairman Barry Hunt announced the sad news that John Gibson had decided to stand down as chairman due to illness. Everyone at Ware To Do Business wishes John a speedy recovery and we look forward to seeing him at future meetings. 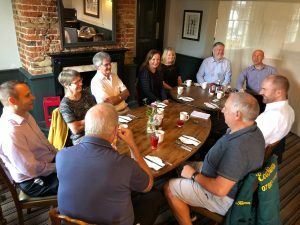 Our final Ware To Do Business networking meeting for 2018 saw a mixture of new faces and regulars enjoying some festive fun. Chairman John Gibson took charge of the informal proceedings at The Feathers Inn, Wadesmill, Hertfordshire, which included a Christmas quiz kindly organised by Chris Kell. As always, we enjoyed a delicious breakfast and had a chance to network and chat about our businesses. 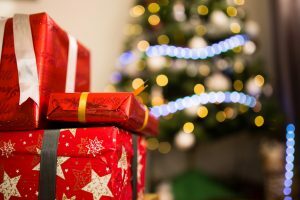 The committee would like to wish everyone a merry Christmas and a happy New Year. 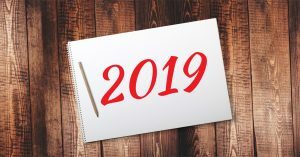 This month we challenged each other to think about our business goals for 2019.
becoming more profitable by charging for extra work. So there’s plenty to look forward to in the New Year! Most people would not consider embarking on a new career when retirement is just around the corner, but that’s just what Ware To Do Business regular Chris Kell has decided to do. At this month’s meeting Chris, who has spent many years working as a counsellor, outlined her journey to becoming a qualified civil funeral celebrant. Having completed her training, Chris can now preside over funeral services in a wide variety of locations. We also welcomed some familiar faces to the group this month, including decorator and signwriter Barbara Murrell who was visiting the area from Hampshire. 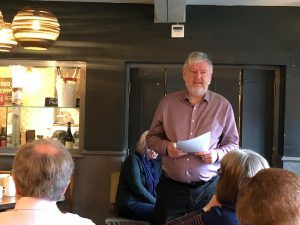 This month’s meeting saw a welcome return by two people who were regulars from the early days of Ware To Do Business. Paul Violet (The Coachman) and Steve Hayward (EcoKlean) first visited the group back when we met in a cafe in Ware town centre. Paul went on to help manage the group, including taking a turn as chairman. Although the Feathers Inn was undergoing some emergency repairs, the friendly staff managed to accommodate us in another part of the historic pub. Over a delicious breakfast we did some informal networking before breaking up into one-to-one sessions to get to know each other a little better. Many thanks to Colin Lock from Mdina International for an interesting and engaging presentation on human resources for SME owners. Colin outlined his long career in management and HR and his partnership with Mdina International, based in Malta. Discussions then turned towards the common issues faced by SME owners surrounding performance management, recruiting, dismissals and equality. Summing up, Colin offered those in attendance a free, no obligation, HR healthcheck. 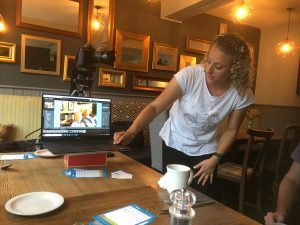 For the July gathering guests were treated to a photography masterclass from Alison of Alison Jenkins Photography. Alison, who is a member of the Royal Photographic Society (RPS), described how she turned her hobby into a business several years ago. Now Alison offers a varied range of services from wildlife to wedding photography, with a growing emphasis on supplying corporate imagery. Along with her husband Simon and a team of highly qualified professionals, Alison provides stunning images for any social or business occasion. You can also find Alison listed on The Best Of Hertford & Ware.